When the first galaxies started to form a few hundred million years after the Big Bang, the Universe was full of a fog of hydrogen gas. But as more and more brilliant sources — both stars and quasars powered by huge black holes — started to shine they cleared away the mist and made the Universe transparent to ultraviolet light. Astronomers call this the epoch of reionisation, but little is known about these first galaxies, and up to now they have just been seen as very faint blobs. But now new observations using the power of ALMA are starting to change this. A team of astronomers led by Roberto Maiolino (Cavendish Laboratory and Kavli Institute for Cosmology, University of Cambridge , United Kingdom) trained ALMA on galaxies that were known to be seen only about 800 million years after the Big Bang. The astronomers were not looking for the light from stars, but instead for the faint glow of ionised carbon coming from the clouds of gas from which the stars were forming. They wanted to study the interaction between a young generation of stars and the cold clumps that were assembling into these first galaxies. Astronomers are particularly interested in ionized carbon as this particular spectral line carries away most of the energy injected by stars and allows astronomers to trace the cold gas out of which stars form. Specifically, the team were looking for the emission from singly ionized carbon (known as [C II]). This radiation is emitted at a wavelength of 158 micrometers, and by the time it is stretched by the expansion of the Universe arrives at ALMA at just the right wavelength for it to be detected at a wavelength of about 1.3 millimeters. They were also not looking for the extremely brilliant rare objects — such as quasars and galaxies with very high rates of star formation — that had been seen up to now. Instead they concentrated on rather less dramatic, but much more common, galaxies that reionized the Universe and went on to turn into the bulk of the galaxies that we see around us now. 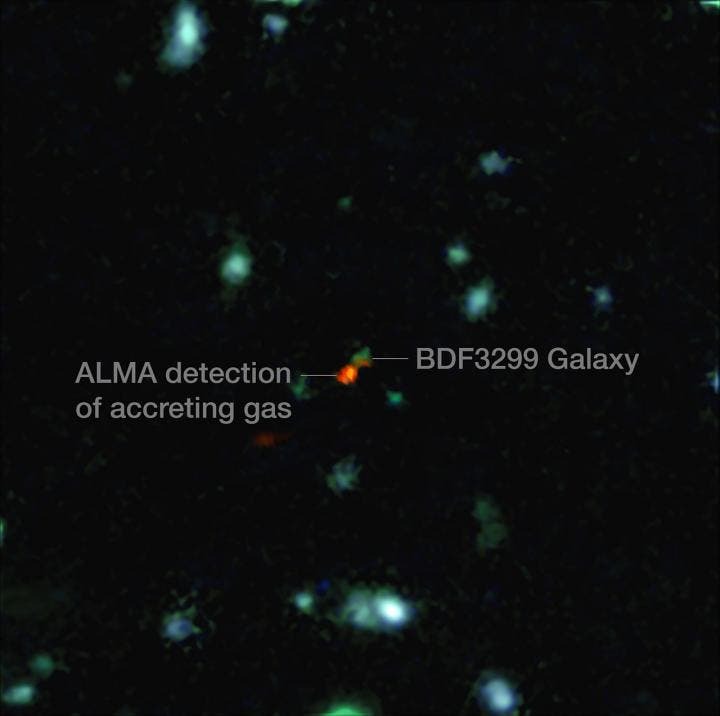 From one of the galaxies — given the label BDF 3299 — shown above, ALMA could pick up a faint but clear signal from the glowing carbon. However, this glow wasn't coming from the center of the galaxy, but rather from one side. Co-author Andrea Ferrara (Scuola Normale Superiore, Pisa, Italy) explains the significance of the new findings: "This is the most distant detection ever of this kind of emission from a 'normal' galaxy, seen less than one billion years after the Big Bang. It gives us the opportunity to watch the build-up of the first galaxies. For the first time we are seeing early galaxies not merely as tiny blobs, but as objects with internal structure!" The astronomers think that the off-center location of the glow is because the central clouds are being disrupted by the harsh environment created by the newly formed stars — both their intense radiation and the effects of supernova explosions — while the carbon glow is tracing fresh cold gas that is being accreted from the intergalactic medium. By combining the new ALMA observations with computer simulations, it has been possible to understand in detail key processes occurring within the first galaxies. The effects of the radiation from stars, the survival of molecular clouds, the escape of ionizing radiation and the complex structure of the interstellar medium can now be calculated and compared with observation. BDF 3299 is likely to be a typical example of the galaxies responsible for reionization. "We have been trying to understand the interstellar medium and the formation of the reionization sources for many years. Finally to be able to test predictions and hypotheses on real data from ALMA is an exciting moment and opens up a new set of questions.This type of observation will clarify many of the thorny problems we have with the formation of the first stars and galaxies in the Universe," adds Andrea Ferrara. Roberto Maiolino concludes: "This study would have simply been impossible without ALMA, as no other instrument could reach the sensitivity and spatial resolution required. Although this is one of the deepest ALMA observations so far it is still far from achieving its ultimate capabilities. In future ALMA will image the fine structure of primordial galaxies and trace in detail the build-up of the very first galaxies." The image at the top of the page shows the Hubble Ultra Deep Field (HUDF). The million-second-long exposure reveals the first galaxies to emerge from the so-called "dark ages", the time shortly after the big bang when the first stars reheated the cold, dark Universe. The new image offers insights into what types of objects reheated the Universe long ago. This historic new view is actually two separate images taken by Hubble's Advanced Camera for Surveys (ACS) and the Near Infrared Camera and Multi-object Spectrometer (NICMOS). 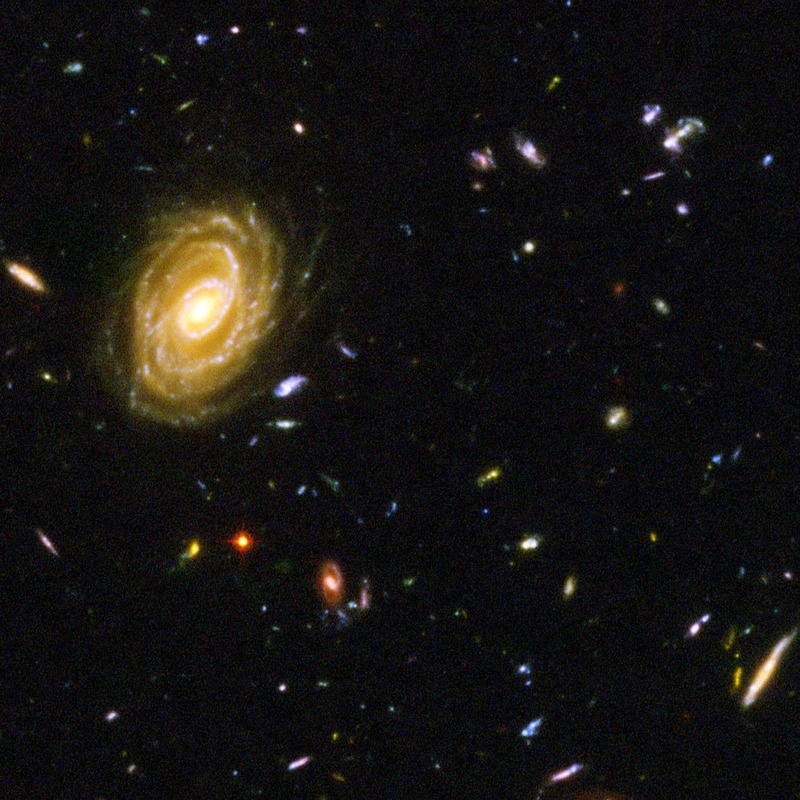 Both images reveal some galaxies that are too faint to be seen by ground-based telescopes, or even in Hubble's previous faraway looks, called the Hubble Deep Fields (HDFs), taken in 1995 and 1998. "Hubble takes us to within a stone's throw of the big bang itself," says Massimo Stiavelli of the Space Telescope Science Institute in Baltimore, USA, and the HUDF project lead. The combination of ACS and NICMOS images is used to search for galaxies that existed between 400 and 800 million years (corresponding to a redshift range of 7 to 12) after the big bang. A key question for HUDF astronomers is whether the Universe appears to be the same at this very early time as it did when the cosmos was between 1 and 2 billion years old.